How we work with schools to meet strict procurement regulations is a frequent question when talking to new education customers. We know that the process is necessarily detailed and often complex but we draw on deep experience in the sector to help new clients and meet their needs. For most of our work, we tend to collaborate with finance and procurement from the outset to enable these key decision-making departments to understand exactly the service offering that SaveMoneyCutCarbon is bringing to the table. At the same time, we cross-check and ensure that we adhere to the respective tender processes, which we also emphasise should never be purely about cheapest price. As part of our comprehensive education offering, we fully manage the complex application process for 100% interest-free funding from Salix. To take one example, we have worked with The Portsmouth Diocesan Trust since the autumn of 2014 as an energy efficiency partner and have undertaken 12 LED lighting installations to date with more scheduled. For each school, we initially survey the site to identify potential energy-saving LED lighting opportunities. Our lighting survey is comprehensive and undertaken by one of our in-house DBS-enhanced checked and experienced surveyors, all of whom are fully qualified electricians. 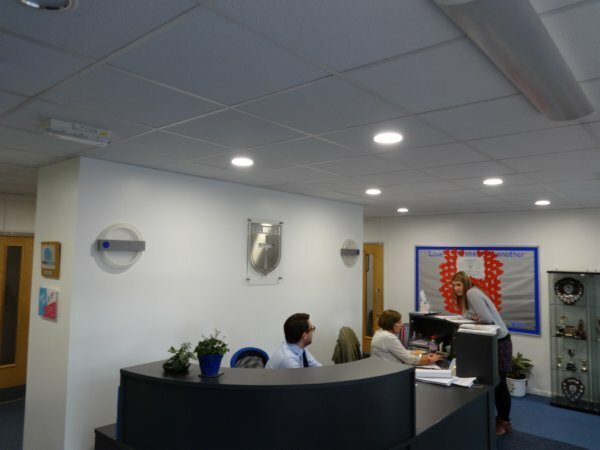 We ensure that the survey incorporates all existing emergency lighting requirements and is also in line with the Chartered Institution of Building Services Engineers (CIBSE) lighting guidance and regulations for schools, which include specific lux levels required for classrooms, public areas and so on. We also consider the use of additional sensors wherever practicable to generate additional energy savings. Our survey clearly maps out all existing lights within each school together with our proposed LED alternative for each individual light. For example, an existing 5-foot fluorescent tube is 58W and our proposed LED retrofit solution is 23W. Each of our products is manufactured by a reputable LED lighting manufacturer and all LED products, except some emergency lighting products, come with a no-quibble 5-year manufacturer warranty. Following the survey, we analyse the data and create an investment-ready proposal and Return on Investment (ROI) based on energy savings alone. All of our recommended products are branded and have previously been installed across a wide range of Salix-financed and other projects. All of our LED products have been considered and approved by the Salix Finance technical team as eligible for Salix financing. Where we find a Salix compliant project, we submit an application to Salix for the funds in collaboration with the Diocese and individual school. We also write all Salix business plans in collaboration with the schools and answer all technical queries that Salix or its consultant company WS Atkins (for projects in excess of £100K) may have. Our core assumptions are all pre-agreed with each school, for example operational hours for each light in each area across the school and cost of kW/h. To date we have had a 100% success rate in securing funding for all Salix eligible and compliant projects. When the funds are secured, we plan the installation with the school, schedule the optimum times to minimise disruption and project manage the works as they are carried out. Our DBS-enhanced checked in-house field services team undertakes all of our LED installation projects. We have created a specific school installation team to work flexible hours and meet the needs of each school, for example 4pm until 11pm and weekends as appropriate to ensure the least disruption possible. An example of one of the Diocese schools we have installed is St Bede’s Catholic Primary at a value of £20,730. The LED retrofit reduced lighting bills by nearly 70% seeing annual savings of approximately £4,000. There will also be additional savings for the school, for example reduced replacement and maintenance cost, and the school’s carbon footprint has also been cut by 70%. The Diocese of Portsmouth did evaluate a wider tender but fully considered the added value we provided, including survey costs, Salix bid completion, Salix liaison, writing of business case where needed and answering all technical questions from Salix. The Diocese preferred the idea of a single organisation that could provide a holistic service. References were also taken up with a full range of our clients as part of The Diocese’ due diligence process. Another successful project was with Nicholas Hawksmoor Primary School in Towcester, which asked us to undertake a site survey, quote for the work and produce an ROI investment-ready proposal for Governors approval. We were one of a handful of companies that competed for this work and we won this contract, completing the installation while delighting the client with results and cost savings. We are also working with the Diocese of Norwich, having held meetings with decision makers within The Diocese and Spire and also invited Salix Head of Schools to attend and present at a meeting. The Headteacher of one primary school attended, was very impressed and had 100% backing from his school governors. We resolved queries with Norfolk County Council on Salix Funding and LED lighting installation at the will be fully reviewed by the Diocese, with a view to rolling out further energy-saving projects throughout its schools. In other public sector projects, SaveMoneyCutCarbon recently won an Official Journal of the European Union (OJEU) competitive public procurement LED lighting tender for Addenbrooke’s Hospital and after the successful supply and installation has secured additional LED work. We have undertaken more than 300 LED and energy efficiency projects over the past three years throughout the UK and are uniquely positioned to undertake projects such as that at Addenbrooke’s.